Global Antibacterial Glass Market size for 2015 was over USD 150 million and is forecast to grow at over 6% by 2023. Rising antibacterial coating demand from end user industries including food & beverage and hospital will drive global antibacterial glass market size during the forecast period. Its ability to prevent spread of microbial germs make its favorable over available alternatives. In health care industry, it finds application in various units including maternity ward, burn unit, geriatric oncology units and infirmaries. Shift in medical sector focus towards new product development to counter infections and diseases will further stimulate the antibacterial glass market share. As per WHO, in developing countries over 10% and in developed countries around 7% of hospitalized patients suffer from infections acquired during treatment. Architectural prevention also has considerable impact in preventing infection. Growing nosocomial infections prevalence is expected to positively influence the antibacterial glass market size over forecast timeframe. The infection can be fatal as it can cause pneumonia, bloodstream infections and urine tract infections. These products are extremely effective against Extended Spectrum Beta Lactamase (ESBL) therefore offer a higher level of sanitation and hygiene in hospitals. Increasing antimicrobial products adoption in consumer electronics like phones, tablets, and phablets is expected to positively encourage the antibacterial glass market during the forecast period. Low market penetration coupled with high products price may hamper the business growth. Stringent government regulations regarding manufacturing of antibacterial coatings may also acts as restrain. The global revenue generated from healthcare application is expected to witness growth at over 7% CAGR by 2023. Increasing adoption and implementation of antimicrobial products in oncology units, burn units and hematology units, as they require sanitation is expected to positively encourage the antibacterial glass market during forecast period. Food and beverage for 2015 was over USD 20 million. Growing antimicrobial packaging demand to store food for longer period will stimulate the business growth. Increasing adoption in restaurants and canteens to maintain the food quality may also responsible to positively influence industry growth. The global revenue generated from medical device coating is expected to witness considerable growth. Technological advancement along with growing adoption of health-improvement devices will be responsible factor to augment the antibacterial glass market share over forecast timeframe. Silver is expected to witness considerable growth owing to its ability to resist pathogenic bacteria including campylobacter jejuni, escherichia coli and almonella typhimurium growth. It finds application in disaster recovery, medical instruments, and military environment. U.S. antibacterial glass market share is expected to witness growth over 6% CAGR over forecast timeframe. Increasing focus towards hospital sector is expected to drive the industry growth. Europe is expected to reach USD 150 million by 2023.Introduction of various standards including EN 1650, EN 13697 and EN 1276 in food industry to evaluate the fungicidal and bactericidal properties of chemical disinfectants may propel the antibacterial glass market size. Presence of major companies in this region is also expected to influence the business growth. 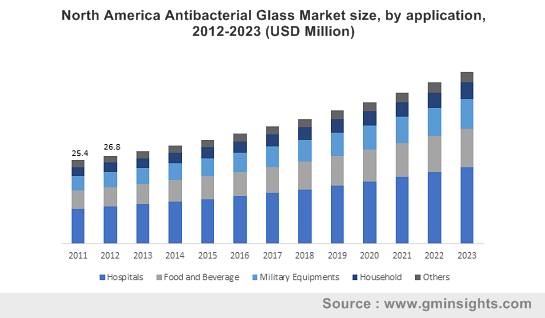 Rising consumer awareness regarding health benefits of functional food, growing needs of aging society and government intervention to promote better nutritional practice will drive the Asia Pacific antibacterial glass market share. It has been analyzed that in Australia approximately 44.2% of population regularly consume supplements, minerals or vitamins from most widely consumed brands including Nature’s Own, Blackmores and Berocca. Growing Aging population and occurrence of non-communicable disease has encouraged the investment towards health care sector which may positively influence the Latin America antibacterial glass market size from 2016 to 2023. Key players in the antibacterial glass market are Corning, AGC, Essex, Saint-Gobain, Glas Trösch Holding, Morley, Beijing JiYan-Tech,NSG, Sprinz, Vetraria Bergamasca Tecnovetro, BÜFA Glas, Archello, Ishizuka and Sprinz. Companies are focusing towards research and development sector to enhance its technical expertise of producing products and improve the manufacturing processes. AGC has introduced antibacterial glass for various application including health spas, hospitals, pharmacies. This product has ability to destroy 99.9% of bacteria that forms on surface and prevent the spread of microbial germs i.e. fungi. Antibacterial glass is used to curb spread of bacteria and fungi formed above the surface. It will prove effective against bacteria including Pseudomonas Aeruginosa, Staphylococcus Aureus and Escherichia Coli. It can be manufactured by using silver or combination of both copper and zinc. Predominantly, silver is used for manufacturing on account of its superior antibacterial properties and ability to interrupt chemical bond among bacteria cells. The silver used in microbial inhibition are used in various forms including silver zeolite, silver nanoparticles and silver salts. It finds application in touchscreen electronic goods, wall covering, mirrors, defense equipment and hospital.